Government perforated British stamps first appeared in 1854, though experimentation with stamp separation had begun as early as 1848. Henry Archer, a London-based Irish businessman, began experimenting with the rouletting of sheets of postage stamps in 1848. The early experimentation with two rouletting machines was a failure, but a few of these experimental stamps have survived. One is shown above. 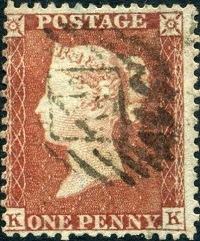 1 P. (1848 - Die 1 - Alphabet 1 - Plates 70-71 - Scott #3c) - Red Brown (Shades) on Bluish Paper. Between 1850 and the end of 1853, Henry Archer experimented with a third machine, using perforation gauge 16. Stamps from these perforation trials were actually sent to post offices and used in various parts of England. They can be told apart from the 1854 government perforated stamps with perforation gauge 16, as these experimental stamps are all from plates with Alphabet 1 check letters. These trial perforated issues are usually collected on cover, with postmarks dated prior to January 1854. There were a couple of government perforation trials, using various perforation gauges, as well. These are all very rare, and they are only certifiable on covers postmarked before January 28, 1854. With only one exception, there were two watermarks used for ALL the perforated line engraved British stamps. They are both shown above. The various plates used to produce the line engraved 1 P. perforated British stamps have two different die types. They are illustrated below. In the Die 2 stamps, the lines of the features are deeper and stronger. The fillet behind the ear is more distinct. The shading about the eye is heavier. The line of the nostril turned downward at the right, and an indentation of color appears between the lower lip and the chin. The transitional period from 1854 to 1858 is VERY confusing. I have tried to present these, as listed in the Scott Catalog, but in the major groups that are presented in the Gibbons Catalog. Therefore, each of the stamps pictured below may have more than one listing in the catalog table below its description. In some cases, it has been most difficult to match the exact catalog numbers from the two very different catalogs that I have used for reference. For anyone that is seriously interested in specializing in the early perforated line engraved issues, I would STRONGLY SUGGEST using the Stanley Gibbons Great Britain Specialised Catalogue - Volume I as your sole collecting reference for all of these issues. Many of these issues are listed in the US eBay site by their Stanley Gibbons numbers as well. For this section only, the Stanley Gibbons Specialised Catalogue numbers will be notated in RED following the Scott Catalog numbers in the tables. 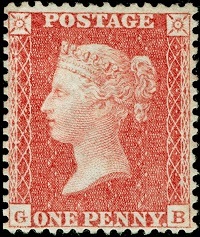 The first government perforated line engraved British stamps, shown above, were issued during 1854 and 1855. These stamps were perforated 16, and they were printed on various degrees of bluish paper that had WMK 18 -- the Small Crown watermark. Plate 4 and Plate 5 of the 2 P. plates have different check letter alphabet types. 1 P. (1854 - Die 1 - Alphabet 2 - Plates 155-204, R1-R6 - Scott #8, SGSP #C1) - Red Brown (Shades) on Bluish Paper. 1 P. (1855 - Die 2 - Alphabet 2 - Plates 1-15 - Scott #9, SGSP #C4) - Red Brown (Shades) on Bluish Paper. 2 P. (1854 - Die 1 - Alphabet 1 - Plate 4 - Scott #10, SGSP #F1) - Blue, Pale Blue. 2 P. (1854 - Die 1 - Alphabet 2 - Plate 5 - Scott #10 SGSP #F4) - Blue, Pale Blue. The three stamps shown above were all issued in 1855. Their attributes are identical to those of the previous group, except that these stamps are perforated 14. 1 P. (1855 - Die 1 - Alphabet 2 - Plates 194-204, R1-R6 - Scott #11, SGSP #C2) - Red Brown (Shades) on Bluish Paper. 1 P. (1855 - Die 2 - Alphabet 2 - Plates 1-21 - Scott #12, SGSP #C3) - Red Brown (Shades) on Bluish Paper. 2 P. (1855 - Die 1 - Alphabet 1 - Plate 4 - Scott #13, SGSP #F2) - Blue, Pale Blue. 2 P. (1855 - Die 1 - Alphabet 2 - Plate 5 - Scott #13, SGSP #F3) - Blue, Pale Blue. The two perforated line engraved British stamps, shown above, were also issued during 1855. These stamps were perforated 16, and they were printed on various degrees of bluish paper that had WMK 20-- the Large Crown watermark. 1 P. (1855 - Die 2 - Alphabet 2 - Plates 1-15 - Scott #14, SGSP #C5) - Red Brown (Shades) on Bluish Paper. 2 P. (1855 - Die 1 - Alphabet 2 - Plate 5 - Scott #15, SGSP #F5) - Blue, Pale Blue. The two stamps shown above were all issued in 1855. Their attributes are identical to those of the previous group, except that these stamps are perforated 14. 1 P. (1855 - Die 2 - Alphabet 2 - Plates 1-15 - Scott #16, SGSP #C6) - Red Brown (Shades) on Bluish Paper. 1 P. (1855 - Die 2 - Alphabet 3 - Plates 22/49 - Scott #16, SGSP #C8) - Red Brown (Shades) on Bluish Paper. 2 P. (1855 - Die 1 - Alphabet 2 - Plate 5 - Scott #17, SGSP #F6) - Blue, Pale Blue. The two perforated line engraved British stamps, shown above, were issued in 1857 and 1858. These stamps were perforated 16, and they were printed on paper with WMK 20-- the Large Crown watermark. 1 P. (1857 - Die 2 - Alphabet 3 - Plates 27/60 - Scott #18, SGSP #C11) - Red Brown (Shades). 2 P. (1858 - Die 1 - Alphabet 3 - Plate 6 - Scott #19, SGSP #F8) - Deep Blue. The two stamps shown above were all issued in 1857. Their attributes are identical to those of the previous group, except that these stamps are perforated 14. 1 P. (1857 - Die 2 - Alphabet 3 - Plates 27/55 - Scott #20, SGSP #C9) - Red Brown (Shades) on Yellowish to Cream Paper. 1 P, (1857-1863 - Die 2 - Alphabet 3 - Plates 27/68 - Scott #20, SGSP #C10) - Red Brown (Shades) on White Paper. 2 P. (1857 - Die 1 - Alphabet 3 - Plate 6 - Scott #21, SGSP #F7) - Deep Blue. Some major changes were made to the line engraved British stamps, beginning in 1858. Instead of having stars in the upper corners and check letters in the lower corners, the new stamps have check letters in all four corners. The check letters in the lower corners are still the ones used to determine the stamps plate position, with the check letters in the upper corners being the same two letters but in reverse order of those in the bottom corners. The PLATE NUMBERS ARE NOW PRINTED ON THE STAMPS. The plate numbers, on each of the following British stamps, are located in the lattice work on either side of the vignette. This can be of tremendous help, when trying to locate varieties that occur on particular plates. The two new 2 P. designs, with check letters in all four corners, were issued between 1858 and 1869. These stamps were printed on paper with WMK 20 -- the Large Crown watermark. They come in two types: Type I - Thick lines above and below head. From Plates 7-9, 12. Type II - Thinner lines above and below head. From Plates 13-15. 2 P. (1858 - Type I - Plates 7-9, 12 - Scott #29) - Blue (Shades). 2 P. (1869 - Type II - Plates 13-15 - Scott #30) - Blue (Shades). The new 1 1/2 P. line engraved British stamps were first introduced in 1860. However the two stamps above were issued 10 years apart. Here is the story. The 1 1/2 P. stamp on the left was prepared in 1860, for an anticipated change in postal rates. The rate change, however, never occurred. Most of the 10,000 sheets of these stamps that were printed were destroyed in 1867. Very few of these stamps have survived. The stamps were re-issued in 1870 and 1874 in a new color, shown at the right. The re-issued stamps are common. 1 1/2 P. (1860 - Plate 1 - Scott #31) - Lilac Rose on Bluish Paper. 1 1/2 P. (1870 - Plate 1 - Scott #32) - Dull Rose (Shades). 1 1/2 P. (1874 - Plate 3 - Scott #32) - Dull Rose (Shades). The new 1 P. design, with check letters in all four corners, was first issued in 1864. Production continued through 1879. These stamps were printed on paper with WMK 20 -- the Large Crown watermark. 1 P. (1864-1879 - Plates 71-225 - Scott #33) - Rose Red (Shades). Plates 69, 70, 75, 77, 126, and 128 were rejected, and no stamps exist for all but one of them. A few stamps from Plate 77 did reach the public, and they are all tremendously rare today. Here is a fun collecting idea for collecting this relatively inexpensive British stamp! Many collectors try to get an example of this stamp from each of the 155 plates used during its production! Since the plate numbers are printed at the sides of each stamp, getting one of each plate number should take little more than a LOT OF perseverance. The tiny little stamp shown above was the FIRST 1/2 P. denomination British stamp, as well as the LAST line engraved stamp produced, until the reign of King George V. This stamp was issued on October 1, 1870, and it was printed on paper with a script "half penny" watermark. 1/2 P. (1870-1878 - Plates 1/20 - Scott #58) - Rose (Shades). In 1880, Thomas De La Rue & Co. of London took over the printing of ALL Great Britain postage stamps. The contemporary line engraved stamp denominations were then replaced by new surface printed British stamps of the same denominations. Below is a link to a dealer in the UK that specializes in the line engraved Penny Reds. He has many specialized books on the collecting and plating of these British stamps in his inventory for sale. Books on the collecting and plating of the line engraved Penny Reds ... Bill Barrell Ltd.